With a 'feed and return' central heating system, the radiators nearest to the boiler/pump would tend to be warmer than the radiators further away. To avoid this, the outlet of each radiator is fitted with a 'lockshield valve' (shown right) which needs to be adjusted when the system is first installed. 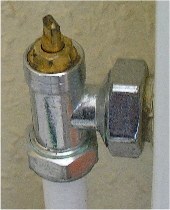 The 'lockshield valve' is normally covered by a push on cover to hide the adjustment. The intention is to even out the flow of water through each radiator so that with the system in its normal operating condition, the temperature drop across each radiator is about 20°F (12°C). Problems with setting up the system may be experienced if the outside temperature is above the design operating temperature - if the outside temperature is above the system design value, the heat dissipated by each radiator will be less than intended by the design, and the temperature drop across each radiator will be less than 20°F. If balancing on a hot summers day, adjust to achieve a lower temperature difference. Once the radiators in a system have been balanced, the valves should not need to be adjusted again unless the pipework or radiators are changed. The easiest way for a diy'er to measure the temperature drop across the radiators is to use a pair of radiator thermometers, they can be purchased or better still hired or borrowed. These thermometers just clip onto the pipework and indicate the temperature of the pipe (which is, effectively, the temperature of the water flowing within it). Most professional plumbers do not use these thermometers, years of experience have enabled them to balance a system just using a hand to check the temperature differences. Start by switching off the system and letting the water cool down. The lockshield valve is normally hidden under a push on cover at one end of the radiator and has an adjustment requiring a long narrow spanner. An adjustable spanner closed very small is probably the best adjuster. Open both the lockshield valve and control valve (normally positioned at the opposite end of the radiator) on ALL radiators. Fit the radiator thermometers to the INLET and OUTLET pipes of the nearest radiator to the boiler. DO NOT fit them to the main flow and return pipes. Switch on the central heating system. Close the lockshield valve on the first radiator to almost closed, as the temperature of the systems comes up, gradually open up the valve until the temperature difference between the two thermometers is about 20°F (12°C). Move the thermometers to the next radiator away from the boiler. Close down the lockshield valve and adjust it until the temperature difference increases to about 20°F (the temperature difference will probably start at less than 20 degrees as both valves are fully open). Work along the rest of the radiators until they have all been balanced.